Welcome Home from This Old House | Web Series For This Old House’s 35th anniversary Norm, Tom Richard, Roger and Kevin bring viewers a special project — not an old house, but a brand new home for a wounded Iraq war veteran, SSG Matthew DeWitt and his family, coordinated by the non-profit organization Homes for Our Troops (HFOT). 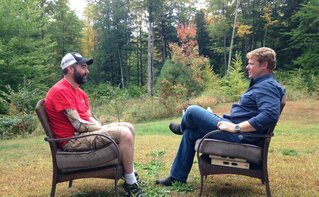 For these episodes, This Old House interviewed three other veterans and home recipients. As a companion to the on-air episodes, This Old House created bonus web episodes profiling these American heroes. Over the course of four weeks, watch these American heroes tell their stories. Watch the four stories below. Army Staff Sergeant Matt DeWitt was on his first deployment to Iraq when his convoy came under attack, and he sustained devastating injuries resulting in the loss of both arms. After a few months of physical therapy, he was able to walk again, but Matt sunk into a deep depression for over a year. When he pulled himself out of it, he met his wife, Cat, and had two lovely children. Matt and Cat are the newest members of the Homes for Our Troops family, and are very excited at the prospect of moving in to their new place. Their current home is a fixer-upper, and neither Matt nor Cat have the time or abilities to complete it the way they wanted to. Staff Sergeant Joseph Beimfohr spent nine years in the United States Army serving as a cavalry scout — being the eyes and ears for commanders on the battlefield. In 2005, he was investigating the execution of contractors in Iraq when an improvised explosive device detonated, killing his fellow soldier, and almost killing him. When Joe left Walter Reed hospital, he purchased a small home in Virginia, but it was difficult to navigate with his wheelchair. He received a home from Homes for Our Troops in 2013 and now enjoys the freedom of having everything designed with wheelchair-accessibility in mind. Staff Sergeant Alex Dillmann was an infantryman in the United States Army when his convoy ran over an improvised explosive device (IED), paralyzing him from the chest down. His wife, Holly, never left his bedside through an entire year of surgeries. Before Alex and Holly’s home from Homes for Our Troops was completed, they lived with Holly’s mother. However the floorplan of her house practically made it impossible for Alex to maneuver around, do anything for himself or leave the home unassisted. Corporal Justin Gaertner joined the Marine Corp when he was 17 years old. He worked as a Combat Engineer and a minesweeper all over the Middle East. On a seemingly routine mission in Afghanistan, while trying to get other injured Marines to safety, Justin stepped on an IED himself, and was critically injured. When Justin was medically discharged from the Marines, he was still getting accustomed to his prosthetics, and his parents’ home wasn’t adapted for his needs. It wasn’t until he received a home from Homes For Our Troops that he was able to fully appreciate the ease of a fully ADA-compliant home.